Did Negligence Kill Knut the Polar Bear? He was the most famous polar bear in the world  the cuddly cub Knut, dubbed Cute Knut, captured people's hearts after his birth at the Berlin Zoo in December 2006. So it's no wonder that his sudden death on Saturday, at the tender age of 4, has sent a nation into mourning  and sparked a controversial debate on the ethics of keeping polar bears in captivity. As the zoo tries to figure out what killed Knut, animal-rights groups are blaming zookeepers for his death, accusing officials of putting financial interests ahead of the famous polar bear's welfare. Knut died on Saturday after collapsing into a pool of water in his enclosure, as hundreds of visitors looked on in horror. In a video posted online purporting to show images of the last minutes of Knut's life, he repeatedly turns around in a circle and then tumbles into the water. Berlin Zoo's bear curator Heiner Klös tells TIME that he last saw Knut on Saturday afternoon shortly before his death and that he looked fine. "I was so shocked to hear that Knut had died  he'd been a big part of my life for the past four years," says Klös. By Sunday, in a sign of Knut's superstar status, a steady stream of visitors was flocking to the zoo to pay tribute to the bear, lighting candles, leaving notes and laying flowers at his compound. The zoo's website has also been inundated with messages of condolence. "Knut, you were the sweetest polar bear that I ever knew  why did you have to die?" wrote one mourner named Anna. Knut shot to fame after his mother rejected him at birth and he had to be hand-reared by zookeeper Thomas Dörflein. Knut was the first polar bear to be born and raised at the Berlin Zoo in 33 years. Images of Dörflein lovingly bottle-feeding and playing with Knut were beamed across the world, and the keeper's round-the-clock care of the fluffy cub melted the hearts of animal lovers everywhere. The adorable cub even shared a Vanity Fair cover with Leonardo DiCaprio in 2007, the pair immortalized by renowned photographer Annie Leibovitz. Knut also became the poster bear for a slew of movements, from vegetarianism  with advocates asking why a polar bear deserves such adoration but a chicken doesn't  to global warming, as German politicians jumped on the bandwagon to rail against the dangers of climate change. While drawing attention to the plight of the endangered polar bear, the little cub also generated millions for the Berlin Zoo through merchandising and ticket sales: according to German media, visitor numbers have increased by around 30% since Knut arrived, and in 2007 the zoo made around $4 million in profit thanks to the bear. "Knut was a p.r. coup for Berlin Zoo. They made a fortune out of him," says Thomas Pietsch, a wildlife expert at the Hamburg-based animal-welfare group Four Paws. "But it's wrong to keep polar bears in captivity. They need a lot of space and they're used to the Arctic climate." Pietsch says the fact that Knut died at the age of 4 is very unusual, noting that polar bears kept in captivity often live up to 30 years or more. "He didn't die of old age," says Pietsch. "Knut was subjected to enormous stress, not just by the media hype and public scrutiny, but also by the fact that he was kept in an enclosure with three females," says Thomas Schröder, director of the German Animal Welfare Association. "Polar bears tend to be loners." Since Knut's death on Saturday, critics have argued that the bear had been behaving strangely over the past year and that zookeepers ignored the warning signs. "Knut was looking apathetic, he lay in a corner of his enclosure  someone should have picked up on this," says Claudia Hämmerling, a Berlin Green Party MP. Since Knut's birth, critics have argued that the Berlin Zoo was wrong to keep him. In 2007, an animal-rights activist caused an uproar among Knut lovers when he was quoted as saying that the popular polar bear should be put down rather than be raised as a "domestic pet." On Tuesday, officials at the Berlin Zoo confirmed the preliminary results of the post-mortem, revealing that Knut was suffering from a brain disorder which led to his death. "The initial results show significant changes in the brain which could be regarded as the reason for the polar bear's sudden death," the zoo said in a statement. Further tests will be carried out in the next few days. In the meantime, zoo directors have hit back at any claims of negligence. "We did everything to look after Knut  it's normal for polar bears to live with other polar bears in a zoo, and the idea was that Knut should learn social behavior and other skills from the older females," says bear curator Klös, adding that up until his death, Knut was flourishing. "He played with the other bears, he was relaxed and strong," says Klös. Which makes the young bear's sad, sudden death all the more mysterious. 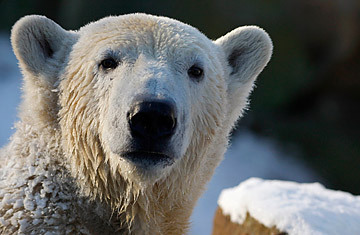 See Knut in TIME's top 10 animal stories of 2007.